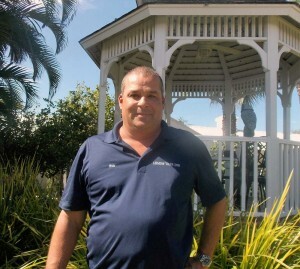 Rob Decastro stands by the gazebo in the Lemon Tree Inn courtyard. Lemon Tree Inn, at 250 Ninth Street South, has been a treasure in Naples since it first opened in 1949 as a motor lodge. Florida visitors traveling along Tamiami Trail between Florida’s Gulf Coast and Miami or The Keys would stop for the night, parking their vehicle in their own carport adjacent to their room. Since then there have been multiple owners and many remodels, but Lemon Tree Inn still offers the Old Florida charm and ambience that visitors, including many Europeans, prefer over fancy, high-rise and high-priced hotels. Rob Decastro has been managing the Lemon Tree Inn for 11 years. He makes the necessary decisions to keep the inn, including all 34 rooms and a beautiful garden courtyard with pool in good shape and pest-free. “When I started managing Lemon Tree Inn we were using a family-run pest control company. Then they were bought out by a larger company and I didn’t like the ‘feel’ of it,” says Decastro. “I wanted a family-owned operation where there is a voice on the other end of the phone, not a recording. So I switched to Collier Pest Control about five years ago. “I like that Collier Pest Control calls me to tell me when they are coming for their monthly treatments,” says Decastro. “And when I have a special need and call them they usually show up that same day. The technicians are knowledgeable and they always return for a ‘return site visit’ to make sure everything is under control. One would think that a cozy inn with 34 rooms could present many pest problems but, according to Decastro, pests don’t usually migrate to other rooms and Collier Pest Control stays on top of it. The courtyard area with many tropical plants and palm trees could also be a great habitat for outdoor pests, but with the help of Collier Pest Control bait stations and their resident cat, named Lemon of course, the courtyard is free of pests and is safe and pleasant for visitors. Rob is a busy manager and doesn’t need to micro manage his pest control company or his home. “I use Collier Pest Control on my own personal property too,” says Decastro. Click Below hear what Rob Decastro has to say about Collier Pest Control.